There once was a time when I tended to be somewhat argumentative in my faith, or at least, that's what I was often told. A quick look at a few of my older blog posts might even suggest the same thing. Lately, though, I think God has been working to soften me a bit. I now often cringe at anything that even remotely smacks of an argumentative spirit, be it in others or in myself. I don't like it one bit. This is even true on social media like Facebook and Twitter. You can see it there all the time. There is always someone who seems to have something to prove. It's like the old Eveready commercial of yesteryear; someone is almost always daring another to knock that battery (doctrine) off their shoulder (I remember that commercial like it was yesterday!) May God forgive us for that arrogant pride. Now, I tend to read from several Bible translations and paraphrases. While my personal favourite is the English Standard Version (ESV), this morning I found myself in the Living Bible. There I read, "When I am with Gentiles who follow Jewish customs and ceremonies I don't argue, even though I don't agree" (1 Corinthians 9:20; LB). This really spoke to me. Arguing doctrine is pointless, and usually even loveless. And if it is loveless, then it is also God-less. "But avoid foolish controversies, genealogies, dissensions, and quarrels about the law, for they are unprofitable and worthless" (Titus 3:9; ESV). Let me ask you, are we busying ourselves with these things? Are we getting caught up in foolish controversies, dissensions and quarrels about the things of God? Who are we kidding? Do we think that such activity makes us more spiritual than the next person? Is it really worth the fight? James said, "If anyone considers himself religious and yet does not keep a tight reign on his tongue, he deceives himself and his religion is worthless. Religion that God our Father accepts as pure and faultless is this: to look after orphans and widows in their distress and to keep oneself from being polluted by the world." (James 1:26-27; NIV). Paul said, "The faith that you have, keep between yourself and God" (Romans 14:22; ESV). That's one of my new favourite verses. Lately I am really beginning to see the importance of keeping doctrines as a private matter between God and myself. Doctrines are important, and they're even important enough to "guard" them (2 Timothy 1:14). But doctrines also divide and faction the Body of Christ, and that is not good. Love is the fulfillment of all the commandments (doctrines) said Paul in 1 Corinthians 13:8-9. Love is the only thing that we are called to express to each other in the Body of Christ; not our doctrinal views. Jesus said that all the law and all the prophets (all doctrines) hang on the two greatest commandments. What were they again? Oh yes, (1) love God, (2) love each other (Matthew 22:34-40). In other words, if we've failed to focus first on the love part, then we've also failed on all our (perceived) doctrinal wisdom as well. "If I speak in the tongues of men and of angels, but have not love, I am a noisy gong or a clanging symbol. And if I have prophetic powers, and understand all mysteries and all knowledge, and if I have all faith, so as to remove mountains, but have not love, I am nothing" (1 Corinthians 13: 1-2; ESV). Do you remember The Gong Show? It was hilarious and I still can smile when I think about it. 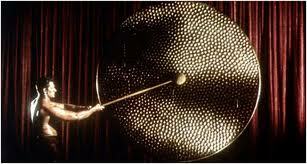 But as funny as that show was, the sound that the gong makes is really quite an annoying. At least in my opinion it is. There is a public garden near our home that has a gong in it. Though several blocks from our home, one can still sometimes hear its vociferous racket from my backyard. The gong produces an irksome noise, much like a know-it-all Christian who cannot (or will not) forgo his sermonizing long enough to show some Christ-like love first. I believe that is essentially what Paul was saying at the start of his infamous love chapter (1 Corinthians 13); all your knowledge, and wisdom, and doctrines don't mean squat if there isn't love. He was saying that all your knowledge, and wisdom, and doctrines are as annoying as that gong if they aren't preceded by real and unfeigned love first. We have this uncanny habit of often putting the wrong thing first. 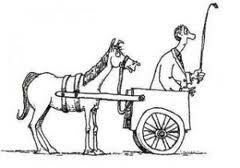 The cart always seems to end up ahead of the horse. Doctrines may be important, but they certainly are not the most important. They rank second at best. The most important is love. This is important enough that Jesus even commands us to "love your enemies and pray for those who persecute you" (Matthew 5:44; NIV). Perhaps we should reorganize our to-do lists. Perhaps if love truly is most important, we should work on that first. Perhaps if love is the horse, and doctrines are the cart, then we should make sure the horse is in front of the cart as opposed to the other way around. I am convinced that if Christians would only get off that doctrinal cart long enough to really learn the art of "love your neighbor as yourself" (Matthew 19:19), then the doctrinal cart would soon correct itself and follow the love horse wherever it trots off to next. In that case, doctrines would soon become non-issues. However, the only way that would ever become a reality is if we all made genuine love the priority and not the doctrines. Ever wonder why there are so many different denominations in christendom today? I'm convinced that the bottom line isn't their different doctrinal views as much as it is that we really haven't learned to love the brotherhood of believers. Maybe that's the answer to getting rid of those (dare I say it?) "anti-Christ" denominations and factions: LOVE. As for those doctrinal discussions, those too would be a lot easier if we loved each other as Christ loved the church. But then again, if we loved like that, I suspect that even the thought of a doctrinal discussion would only be a distant memory at best. I mean, if you and I really and truly loved each other, then neither of us would care less about doctrines either. In that scenario, the very word "doctrine" would go the same way as other archaic Elizabethan words have already gone. Now, what were we arguing about again? I seem to have forgotten. "Arguing doctrine is pointless, and usually even loveless. And if it is loveless, then it is also God-less." So true, brother!! !